This full-day adventure along the 52-mile road to Hana highway takes you to experience the dramatic beauty of the remote Hana Coast, with its 617 curves and 54 one-lane bridges, from the comfort of an 8-passenger limo-van. Walk through enchanting Hana Tropical Gardens, view glistening waterfalls, wild tropical flora and sea cliffs through the large panoramic windows. Enjoy a picnic lunch at a black sand beach, before returning from Hana at a no-rush, “Maui-style” pace. Bring your bathing suits and towels and enjoy an ocean swim after lunch or take a splash into a cascading waterfall. Includes Full Run-of-Menu Breakfast in Café Mambo or Island Fresh. Three-course Luncheon, with Salad, Choice of Entrée, Dessert and non-alcoholic beverages, at the Travaasa Hana Hotel. Guests dine in the scenic Ka’uiki Dining Room, over-looking the pastoral grounds of the hotel and Hana Bay. Free refills of beverages:Filtered Coffee, Sodas, Lemonade and Hot or Iced Tea. Enjoy the remote Hana Coast at a leisurely and relaxed pace. See Kaumahina State Park, Keanae, Waikani Falls and more. Swim in a fresh-water pool under a cascading waterfall or at a secluded beach (conditions permitting). Stop at famous Hookipa beach and other scenic spots. Hawaii State Law requires children (7 years old and under) to ride in a child safety seat or a booster seat when riding in a motor vehicle. Light Morning Snack: Breakfast Pudding Ring, Choice of Tropical Island Fruit Juices and Coffee. Chicken Wrap: Grilled Herb Marinated Chicken Breast with Mix Organic Greens, Roasted Corn & Black Bean Relish, Buttermilk Ranch Dressing on a Roasted Garlic Tortilla. 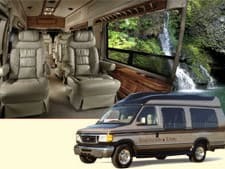 Temptation Tours will pick you up in a 6 to 8 Passenger, Luxury Limo-Van. If the minimum requirement is not met prior to your tour date, your reservation may be cancelled or you have the option to reschedule. Please call the Activity Provider upon arrival to reconfirm your reservation. Dress warmly due to air conditioning. All Tours operate rain or shine. Tour durations, itineraries, and viewable sights are subject to change, without notice, due to inclement weather. We recommend booking at least 4-5 days in advance. If you have very specific schedule requirements and are not flexible, please book sooner. Last-minute bookings are often possible, but availability is limited. Yes, this is a great trip for all ages. My sister and I were upgraded to a helicopter tour to Hana. Then we came back by limo to our hotel. It was a great trip and we enjoyed every minute!